ONCE Mason Weatherup finished off a fine team move with his second goal in the 46th minute of this final in MUSA Cookstown yesterday, the Danske Bank JJ Reilly Cup was certain to the make the historic journey to Lagan College Belfast. 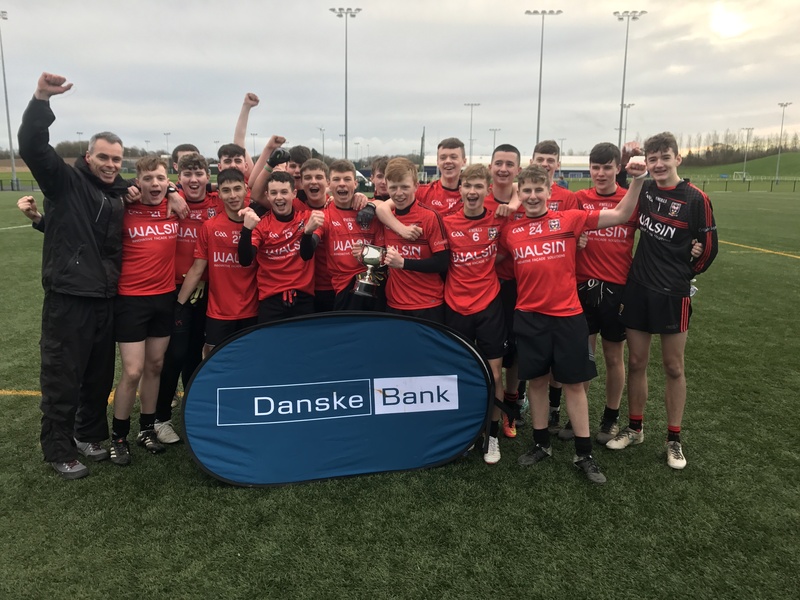 Drumragh have been the trail-blazers for the integrated sector after they won this particular provincial trophy two seasons ago and yesterday Lagan College made it a double after the first ever final involving two integrated schools. The significance was not lost on winning coach Gary Donnelly. “This was a big day for both schools and for us a huge step forward in terms of Gaelic games. “Four years ago these boys participated in a Year 8 blitz up in Ballymena, run by Ulster Council specifically for schools from the integrated sector. We won that day and the boys really enjoyed themselves. “Since then we have played, like Drumragh, in the main stream Ulster Schools’ competitions and were narrowly beaten by St Patrick’s Banbridge in the Ennis Cup semi-final. That was frustrating, because the boys didn’t get to experience the build up to a final and then the final itself. But will Lagan now push on through and play at senior level for the first time? Jimmy Smyth, chairman of the Ulster Schools’ GAA Council, presented the Cup to captain Charlie Cooley and also noted the significance of the day. “Yes, in terms of the development of our games, this is a much more significant day than the MacRory or Mageean Cup finals. “Last month I watched a young lad Stuart Martin from Regent House in Newtownards play a significant role in An Dún winning the Mageean Cup in hurling for the first time and earlier today Matthew Murnaghan from Drumragh College became the first player from the Integrated sector to win a Schools’ football All-star. “We have two games that should be played by everyone, and we want them played and watched by everyone. To that end I applaud the coaches in these two schools and in all participating schools for the work they put in in preparing teams to represent their schools. A key player in Lagan College’s success was goal-keeper Conor McNulty who brought off two excellent saves, one in each half, to deny Maddox Roberts while his opposite number Jamie Logue was also quick off his line to save from Mason Weatherup and turn another rasper on to the crossbar. Mason however was not to be kept down for long and his 16th minute goal opened a gap for Lagan College that they stretched to 1-5 to 0-3 at the break despite the best efforts of Jakub Krawczyk, Tiernan McClean and free-taker Daniel O’Neill. As the game wore on the talent of Bredagh’s Oran Magee, Joe Toland and Charlie Cooley came through and Mason Weatherup eventually sealed the game with a goal at the start of the last quarter. Callum Crone added icing to the cake with a third goal seven minutes from time, but football was the real winner as Charlie Cooley collected the silverware for Lagan College to store for a year. Subs : B McCartney for J Lozano (52).